Astronomers have found evidence for a large population of hidden supermassive black holes in the Universe. Using NASA's Nuclear Spectroscopic Telescope Array (NuSTAR) satellite observatory, the team of international scientists detected the high-energy x-rays from five supermassive black holes previously clouded from direct view by dust and gas. The research, led by astronomers at Durham University, UK, supports the theory that potentially millions more supermassive black holes exist in the Universe, but are hidden from view. The scientists pointed NuSTAR at nine candidate hidden supermassive black holes that were thought to be extremely active at the centre of galaxies, but where the full extent of this activity was potentially obscured from view. High-energy x-rays found for five of the black holes confirmed that they had been hidden by dust and gas. The five were much brighter and more active than previously thought as they rapidly feasted on surrounding material and emitted large amounts of radiation. Such observations were not possible before NuSTAR, which launched in 2012 and is able to detect much higher energy x-rays than previous satellite observatories. "For a long time we have known about supermassive black holes that are not obscured by dust and gas, but we suspected that many more were hidden from our view," said lead author George Lansbury, a postgraduate student in the Centre for Extragalactic Astronomy, at Durham University. "Thanks to NuSTAR for the first time we have been able to clearly see these hidden monsters that are predicted to be there, but have previously been elusive because of their 'buried' state. "Although we have only detected five of these hidden supermassive black holes, when we extrapolate our results across the whole Universe then the predicted numbers are huge and in agreement with what we would expect to see." Daniel Stern, the project scientist for NuSTAR at NASA's Jet Propulsion Laboratory in Pasadena, California, added: "High-energy X-rays are more penetrating than low-energy X-rays, so we can see deeper into the gas burying the black holes. NuSTAR allows us to see how big the hidden monsters are and is helping us learn why only some black holes appear obscured." The research was funded by the Science and Technology Facilities Council (STFC) and has been accepted for publication in The Astrophysical Journal. The findings are being presented at the Royal Astronomical Society's National Astronomy Meeting, in Llandudno, Wales, today (Monday, July 6, 2015). 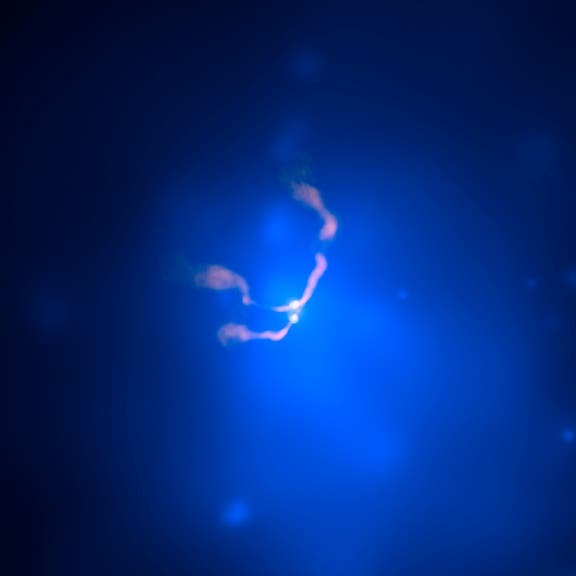 The NASA/Chandra X-Ray Observaory image at the top of the page shows two supermassive black holes at the center of galaxy 3C 75, orbiting each other in a binary system.